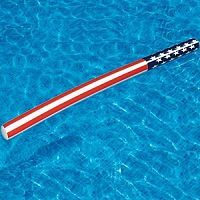 Celebrate independence and freedom with the inflatable Americana Pool Doodle from Swimline! This pool toy is super portable; simply deflate, roll it up, pack it in a suitcase or swim bag and quickly inflate for swimming fun! Inflated doodle measures 72" (183cm). With a stylish stars and stripes motif, this durable vinyl Doodle is perfect for your Memorial Day Cookout, your 4th of July Pool Party, or for your everyday American pride! Repair patch included. Bring your patriotic spirit to any party with this doodle pool toy from Swimline! Keep it poolside or take it along on trips to the beach or lake. Once deflated the doodles take up no room. Doodles are durable enough for kids to jump on and rough house with but also come in handy when simply lounging in the water. Doodles make learning to swim easy, giving kids water confidence and something sturdy to hold onto. Water aerobics classes can also make good use of these.